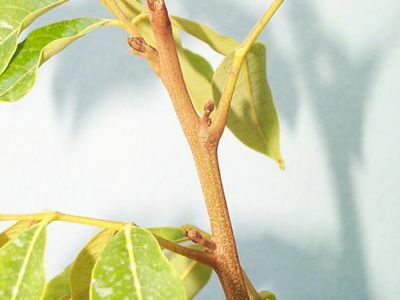 Your tree(s) must experience bud break of 2mm to 4mm during an extended period of cool weather. Lychees flower during the cooler winter months as it is during this time that the mean temperatures can consistently fall below the 68 degree threshold required for bloom formation (November - February in the northern hemisphere and April - August in the southern hemisphere) During a warm winter (average temperatures above 68 degrees) most lychee trees will grow vegetatively and not produce flowers. It has been generally established that if the mean daily temperature is above 20 degrees C (68 degrees F) new growth will be vegetative (i.e. leaves and branches) whereas if the mean temperatures are below this temperature flower panicles will form from emergent buds. This process is known as flower bud differentiation and is a function of internal plant hormone levels, environmental conditions and temperature. 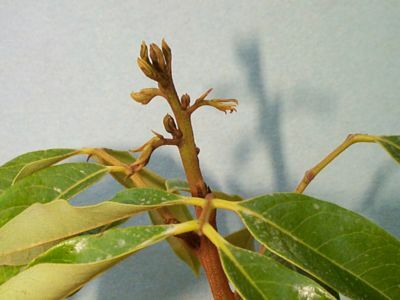 When the buds first emerge they are a mixture of flower and leaf buds. As the bud continues to grow the leaves fall off and an inflorescence develops if the temperatures remain low. If the temperatures remain high a mixed inflorescence with both flowers and leaves can develop. If you are thinking that a solution to getting flower panicles during the winter months is to force bud break by pruning prior to the onset of an extended cold period, think again. The problem with this approach is that the remaining leaves left after the pruning are too old to support a good crop because the photosynthetic capacity and nutrient and energy output of the leaves diminishes with age. Lychee tree leaves have a finite lifetime and are shed from the tree periodically. If you are faced with a situation of winter vegetative growth flush you can selectively pinch prune the growth flush thereby leaving some new leaves to support fruit development if subsequent bloom panicles emerge following the pruning. A better strategy is to time your postharvest pruning so as to insure bud break during the cooler season.